The Beijing-Shanghai High-Speed Railway has opened, cutting journey time between China's political center and commercial hub in half, to under five hours. 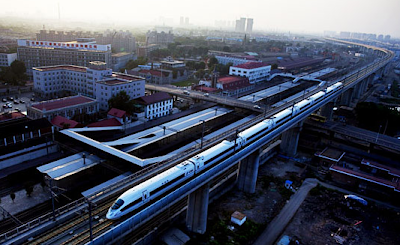 The 819 mile long rail line was completed in just three years and has trains that travel at 300 kph (186mph). China now boasts more than 8,300 kilometers (5,100 miles) of high-speed routes, turning a non-existent network to the world's longest in a few short years.